This interesting surname is of Old Norse origin, and is a locational name from a place thus called in the parish of Sowerby, Lincolnshire. 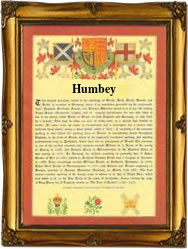 The placename was recorded as "Humbi" in the Domesday Book of 1086, and as "Humby" in the 1242 Book of Fees. The derivation of the placename is from the Old Norse personal name "Hundi", with "byr", village, homestead; hence "Hundi's homestead". During the Middle Ages when migration for the purpose of job-seeking was becoming more common, people often took their former village name as a means of identification, thus resulting in a wide dispersal of the name. The surname can also be found as Humbey, Humbie and Humbee. Recordings of the surname from English Church Registers include: the christening of George, son of George Humbee, on August 7th 1603, at St. Mary Woolnoth, London; the marriage of Jone Humbey and George Hanson on April 2nd 1657, at Worksop, Nottinghamshire; and the marriage of Joseph Humby and Anne Buck on April 26th 1698, at St. Martin in the Fields, Westminster, London. A Coat of Arms granted to the Humby family is a red shield with a gold eagle displayed, in chief three gold bees, the Crest being a red eagle displayed charged on the breast and on either wing with a gold bee. The first recorded spelling of the family name is shown to be that of Margarette Humby, which was dated September 20th 1586, marriage to William Greswell, at Stroxton, Lincolnshire, during the reign of Queen Elizabeth 1, known as "Good Queen Bess", 1558 - 1603. Surnames became necessary when governments introduced personal taxation. In England this was known as Poll Tax. Throughout the centuries, surnames in every country have continued to "develop" often leading to astonishing variants of the original spelling.